Harbour Green Place is the last residential waterfront development to be built in Coal Harbour and is in close proximity to the Vancouver Trade and Convention Center and Vancouver's financial, shopping and entertainment districts. Harbour Green Place consists of 3 towers on a lushly landscaped eight-acre parcel on the harbourside promenade. 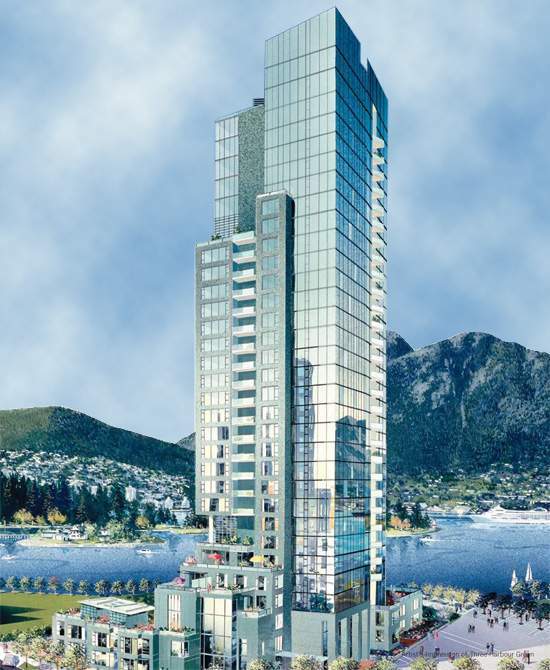 Three Harbour Green is the last residential tower to be built on the Coal Harbour waterfront. Presales began in June 2008. The complex consists of 81 units including 8 townhomes and several 2-level suites. Central air-conditioning and heat, kitchen cabinetry by Snaidero of Italy and Miele appliances-including the latest "speed oven", bathroom vanities from L'O di Giotto of Italy and fixtures from Fantini Rubinetti, and of course floor to ceiling windows to enhance the tremendous views of Coal Harbour and the North Shore mountains. Underground private multi-car garages are included with each residence.